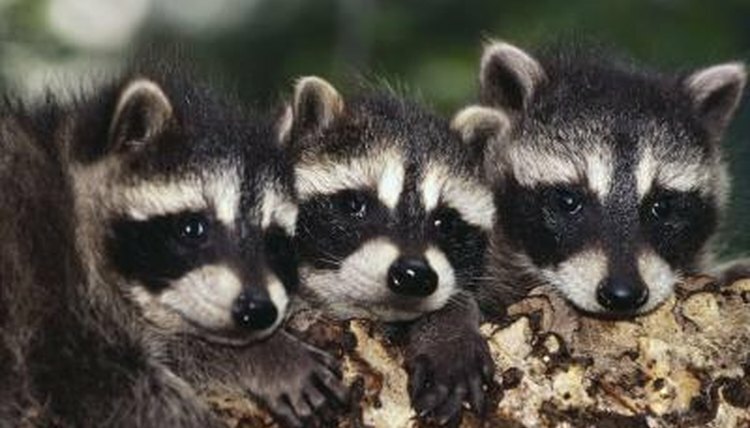 Raccoons invest months in raising their young, and the females do their best to make sure their babies are protected. While there are no guarantees that they can keep them safe, mother raccoons hide their babies in safe spots, teach them how to survive on their own and fight off would-be predators looking for an easy meal. Raccoons mate in the spring and then the father abandons the family and returns to a solitary lifestyle. The mother will usually have two to five babies, called kits, about 65 days after mating. Raccoon babies are born blind and helpless, so it’s up to the mother to find a safe place for them to live. She will look after them and care for them until they are able to take care of themselves, usually when they are 9 months to a year old. A mother raccoon makes a den in a tree or she may move into a burrow that has been deserted by a woodchuck or another animal. Raccoons that live around humans will take advantage of other housing options and find quiet nesting spots in barns, attics, basements and outbuildings. The raccoon family typically remains safely in the den for about seven weeks, and then they’ll move house, finding a new den every few days to keep predators from discovering them. When a mother raccoon chooses her nesting site, she selects an area away from potential threats to her kits. This not only includes predatory animals, such as bobcats, owls and coyotes, but also other raccoons. Female raccoons tend to be territorial and may not tolerate sharing their area with other raccoon families. Only when her babies are agile enough to run and climb will the mother take them outside of the den to begin teaching them to fend for themselves. Although the male raccoons can get aggressive during the breeding season and may fight with other males, they don’t play a part in raising their babies. Females with young can also be quite aggressive and will stand up for their families if they feel their kits are threatened. They will fight to protect their young from any and all invaders, even well-meaning humans that stumble upon the nest. Though predators may grab kits if they’re left unguarded, when the mother raccoon is around hungry animals are likely to look elsewhere for a meal.